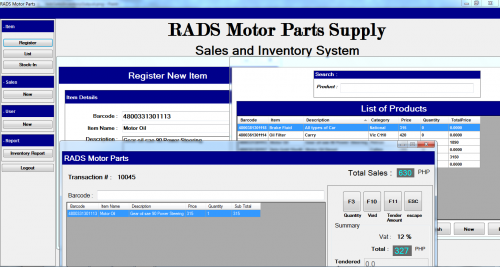 RADS Motor Parts Sales and Inventory System is a software-based System that uses abarcode scanner for fast processing of sales that will save you time. This system helps track the inventory and sales activity of the company with no financial fees. It includesupdating of inventory levels, date, price and customer and transactions of entry records of the products purchased. This system is made of Visual Basic 2008 and MS Acess for its database.